Deputy Mayor and Stadtkammerer (Municipal Treasurer) Doctor Kurt Lisso (March 7, 1892 - April 18, 1945), at desk, his wife Renate Lubbert (April 12, 1895 - April 18, 1945), in chair, and their daughter Regina Lisso (May 24, 1924 - April 18, 1945) after committing suicide by cyanide in the Leipzig Neue Rathaus (New Town Hall) to avoid capture by American soldiers of the 69th Infantry and 9th Armored Divisions as they closed in on the city. Regina Lisso wears the armband of the German Red Cross. 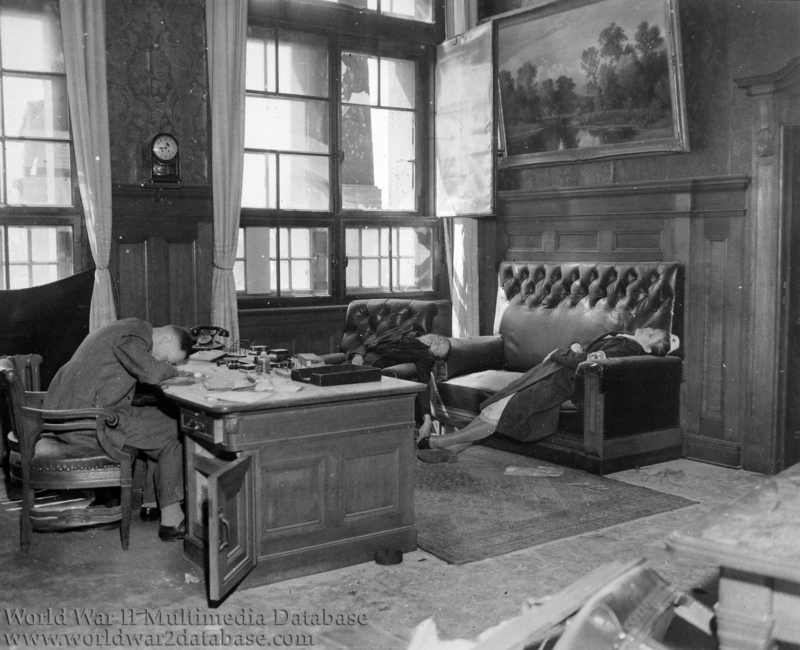 Also found dead in the Rathaus was Oberburgermeister (Mayor) Alfred Freiburg and his wife and daughter and former Mayor and Volksturm General Walter Donicke as well as several Volksturm officers. The 777th Tank Destroyer Battalion's official history says the Americans overshot the Rathaus because of old maps on April 18, and the assault began the next morning on April 19. American tanks fired on the Rathaus from 0730 to 0910 Hours, when a captured German officer carried in a surrender ultimatum. The Rathaus commander accepted the terms at 0930. the Americans captured one major general, 175 enlisted men, and thirteen Gestapo police. The American flag was raised over the Rathaus around 1200 Hours. The scene of the Lisso suicides was extensively photographed by Robert Capa, Margaret Bourke-White, and Lee Miller, as well as the United States Army Signal Corps. For reasons that remain unclear, the Freiburg family was not photographed.